Last Sunday Laurie and I had dinner together (she cooked) and we watched Julia and Julie. I really enjoyed the movie. Meryl Streep was excellent in her role as Julia. Julie was the blogger. I was struck by the fact that her blog had substance-unlike most of my ramblings. Oh well-I don't intend to write a book, so I will just ramble on! 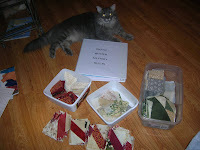 Kristie has all of her fabric cut for our swap. Mine is in a pile in the living room. I have put away the Christmas decorations of piles of red and green fabric! I seem to be a little short on the light fabrics. But I need to start cutting this weekend. 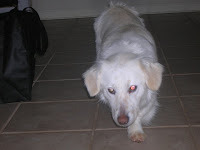 Equal time for the granddog..
Lillie has been in the family for a year now. Laurie rescued her from a group in Gwinnett county. She has a wild personality to make up for her less than perfect looks. I am not sure what breed she is..a little Corgi, dachshund...who knows. She is long and low to the ground. She gets excited when she has visitors and has a neighborhood boyfriend who buys her presents. I spent the end of Christmas Eve with Lillie. It took her quite awhile to settle down and go to sleep. No visions of Santa Claus for her..she just wanted to play. She has not come to visit me here yet...we are not ready for all that energy. Maybe when she is a little older. Merry Christmas to all. It was a wonderful time for all of us here in Georgia. As expected, Alice did sleep through much of Christmas eve celebration. Sarah and Emma were in the Christmas pageant as angels. It was interesting as one of the three wise guys looked like a pirate! Kris and Laurie worked for 2 days on Christmas eve apps and did a Great job. I went to Laurie's house after that to visit the granddog. That is a story for another time! Christmas day was with the Fried's. More food-I need not eat for a week! Sarah proudly displaying her first quilt. She did a great job on it and the only part she did not do was the clipping of the seams. Another holiday put to bed. One more day of work and then four glorious days off!!!! Tomorrow is dedicated to making Swedish coffee cake and Swedish meatballs for Christmas Eve supper. These are the traditions of my childhood. My mother had other "Swedish delicacies" that I never developed a taste for but I cherish the ones that I continue. 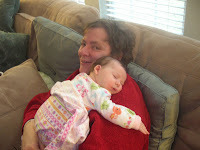 After church and the Christmas pageant, we will meet at Kris and Tyler's to help Alice celebrate her first Christmas. She will probably sleep through most of it. Christmas day will be spent with Sue and family-Sarah and Emma will not be doing much sleeping! I am still playing with Carolina Christmas and my border for it. I think it is not as busy as Bonnie's design. 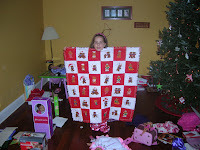 This quilt will hopefully adorn my bed next Christmas! I absolutely HATE the cold. I just can't tolerate it anymore. My friends don't understand: " you're from NY-this shouldn't bother you". But it does. And as a result of being cold, I end up vegging on the couch under a couple of quilts. Then I fall asleep and wake up in the middle of the night. And so the cycle continues. I did get Snugglebutt's Christmas stocking delivered to her. I also did a turkey run to Sue's house and stopped and finished Christmas shopping. Then I came home and worked a bit on Carolina Christmas. I am doing a different border. 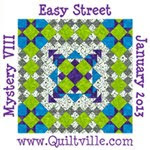 One that I have done before on another quilt. So now it is cut another million pieces of rectangles. Also went foraging for repro fabric for our swap. Gotta a lot of cutting to do before next Thimbles. twas the weekend before Christmas..
and I am not ready! Today was Thimbles regular meeting and then the cookie exchange. I took Carolina Christmas with me and finished putting it together. I did not do any preplanning or arrangement. 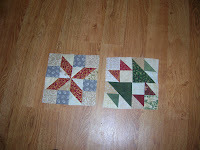 I just sewed alternate blocks together. I didn't take a picture of it but several other did. I am pleased with the outcome. I just downloaded Bonnie's border and I am thinking I am not going to do this. My initial thought is to use a scrappy plain border-inner beige and outer red. But as it currently is the middle of the night, I will sleep on it. Did some more work on Carolina Crossing at Thimbles. When I got home, I made Alice's Christmas stocking-cross one thing off the weekend "to do" list. I've been sleeping on the couch most of this evening, so now I will try moving into the bedroom. The weekend before Christmas and I still have a lot of things to do. Can't figure this out as this started out as a low key holiday season. The rain continues and I am thinking that I need to check ebay for availability of an ark. Cold and rainy..almost as bad as the "s" word but not really. Cookie baking (burning) is on tap for this evening. I borrowed the cookie gun from Kris. I plan on making chocolate spritz for the cookie exchange at Thimbles tomorrow. This weekend it is necessary to complete Alice's stocking. She won't know if it's not done but I will. My Laurie is celebrating a big birthday tomorrow. I think she is planning on a Buckhead weekend. I can't wait until it is time to go home. I am ready!!! I started checking Bonnie's site early this morning..don't know why-I was at work but I couldn't wait to see what she had in mind. I had to make some stops before I got home tonight-gift needed for tomorrow and thrs. Then some other things that needed to be done. I did put three blocks together and organized the rest into sets. If I weren't so tired, I would sew some more but that's not going to happen tonight. I really like it. Sarah wanted to know if I was going to experiment. I don't think so. Sue was already at my house by the time I got home and the their toys were out and the TV on. Sue and Rob went sown to Atlanta for a night out. Don't know which hotel they stayed at but they had a good time. 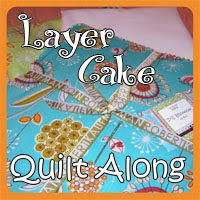 Sarah and I worked on her rag quilt project for her Brownie try it badge. After the first few blocks, she did all the sewing of the blocks by herself. This morning we sewed the quilt together. I just helped guide the material. I sent Sue home with my rag clipper but her project is done. I will get a picture of it after it is ragged. They went home and then I TOOK A NAP! The weather is cold and rainy and I never even bothered to get dressed. All in all, a good weekend. Hop over to Gretch's blog for a great recipe. Her pound cake was Yum! I have a new decorating decor for this holiday season. And it doesn't involve going into the garage and hauling all those boxes of misc. Christmas decorations. 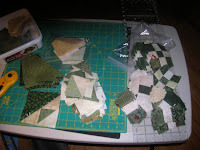 Since I am working on the Carolina Christmas, I have sorted piles of red, green and beige fabrics. They are in containers in the living room. Instant decorations-just the right colors! I am making good progress on the block construction. I might even have them together before Bonnie gets back and sends the next step.For right now, I guess I will go to bed. I got up late, late last night to see if Bonnie had uploaded step 5. 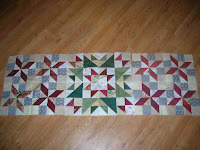 This morning I just HAD to sew two blocks together to see how it loooks in person. I replaced her yellow with light gray and I was not sure if I was going to chnage it or not. I think I am going to keep the gray. Mine will be a Cloudy Carolina Christmas! What do you think? 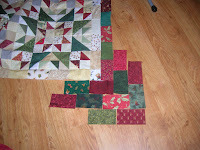 I made good progress with step four of Carolina Christmas-all the half square triangles are together but still have the rest of the block to construct. The block pictured above is part of Carolina Crossing. As usual, Bonnie likes itty bitty pieces. The triangles are 2 5/8 squares cut twice on the diagonal! When I told Kris about this, she asked if you glued them together! My other project completed this weekend-sorting through multiple Christmas card lists that I would just throw in a box after addressing the cards. Laurie will be glad to know I took her advice and made a spread sheet on the computer and threw out all the other lists. Carolina Christmas Part 3 -done! 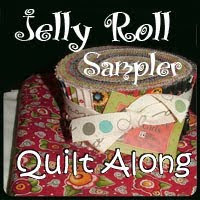 One of the other blogs I was reading said that this quilt is not for the faint of heart with all the pieces...oh so true. I cut most of last evening to prepare for part 4 and I sewed off and on all day today to complete Part 3. Willie was the inspector on this section. I met Cindi in Snellville this AM and we headed out to Sweet Home. It was a happening place today. 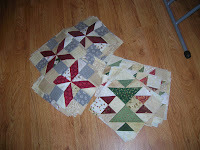 I picked up some Christmas type fabric with nothing in mind currently but I will put it with my other reds and greens. Now I know that Bonnie says it is not a race and we should proceed at our own rate. Last evening I finished part 2 and started cutting the red for part 3. This AM before work I got a start on the 592 background squares to be cut. And it seems to me that the next step is due out the beginning of next week. I know I could just not open the step but as they say...curiosity killed the cat. So I have piles and piles of fabric likely to be incorporated into the project sitting in the living room. I have been cutting while watching TV. I am glad it is Friday and I can play all day tomorrow. Sweet Home is having an open house. No telling what Bad Melisa is cooking up but it will be good. 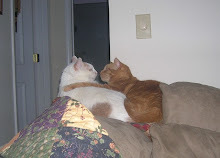 I am going to meet Cindi in the AM and we will go out there together. The S word is predicted in northern GA for during the night. Hope it doesn't make it to the metro area. The crazies will probably be at Publix this afternoon stocking up on bread and beer! I have to hurry up and work on this before Bonnie posts the next section. Of course it helps if I sew the parts together correctly. This evening I did some unsewing on this section. 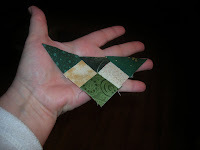 Also had to cut more triangles since I miscalculated on that as well. I completely frustrated myself last evening on the shutterfly Christmas card. This evening, Laurie was pressed into service and it is done. Now I just need to locate my Christmas card list!